Martin Luther King Jr. Day is a useful day to reflect on how the environmental movement manifests our nation’s civil rights goals. We’ve certainly increased awareness of environmental injustices that disproportionately hurt people of color and women, and serve a wider community with educational programs. But we’ve done so while our own leadership has backslid toward less diversity and inclusion, according to a recently released annual audit by Green 2.0. Grist further examines the report and the issues it raises. The assessment relied on voluntary self-reporting, and several notable environmental charities declined to participate. The central thrust, however, is confirmed by our volunteers’ observations. Because of historic racism that excluded African Americans and others from public swimming pools and beaches (and costs associated with maritime recreation) leadership in waterways groups tends to be white, even in a multicultural hub like New York City. HarborLAB itself was founded with a mission of inclusion in STEM (science, technology, engineering, math) fields by a white man who serves as Executive Director, and the majority of our Board is the same. We’re very encouraged that HarborLAB’s rising volunteer leaders include more women and people of color than is typical among on-water programming groups without paid staff. As HarborLAB explores paths forward toward adding paid professional staff, independently with a larger Board or through affiliation with a higher education institution, we commit to growing our diversity and inclusion. We’ll always seek ways to bring free educational and recreational opportunities to all, especially those who have traditionally been underrepresented in maritime life and environmental science. Thank you for joining us in these efforts, and sharing the joyful fruits of progress. Volunteers reported that this week’s snowstorm played havoc with personal and work schedules, just ahead of Thanksgiving travel and hosting obligations. Respecting those needs, we’re postponing this weekend’s boat building and seed gathering activities to Dec 1 and 2, respectively. We thank volunteers for their feedback! Green Drinks at Blissville’s Bantry Bay! Green Drinks Queens at Blissville’s Bantry Bay! No cover. Cash bar with green drink specials! Come welcome autumn and harvest bounty with a shared promise to work through the cold to make each spring a greener start for Queens, NYC, and our world! Green Drinks Queens is the official local chapter of Green Drinks (http://www.greendrinks.org/ny/queens), a self-organizing network of people who care about the environment and gather regularly to informally build community around this greatest cause of our lifetime. HarborLAB is a lead partner in Green Drinks Queens. Our deep gratitude to host Bantry Bay Publick House, known for its authentic Irish New Yorker bar and spacious banquet hall (https://www.bantrybaynyc.com/privateparties). If you belong to an environmental organization or work for green company, or do environmental research, please feel free to put your literature on our community table! Please, no partisan or directly political materials. 730PM: Blissville ecology trivia game (approx. 20 minutes) conducted by Erik Baard and Gil Lopez of Smiling Hogshead Ranch urban farm and Montauk Cutoff Coalition. 730PM: Closing remarks. Networking continues. Join our event volunteer team by registering here! City of Water Day in Lower Manhattan and LIC! Fun fact: City of Water Day, produced by Waterfront Alliance, was founded as the Five Borough Harbor Ramble by volunteers who went on to found HarborLAB! We’re grateful to Waterfront Alliance for growing the event beyond what we originally imagined! In each year of HarborLAB’s existence we’ve provided a central program to the event, and this year we’re doing it in two locations, thanks to Better Chinatown USA, Hunters Point Parks Conservancy, and, of course, Waterfront Alliance. HarborLAB will provide safety support to the Con Ed Cardboard Kayak Race and then two public paddling sessions. HarborLAB’s Seaport District public paddling with Better Chinatown USA in the Seaport District will run from 1PM-4PM (line closes at 340PM). HarborLAB’s sunset public paddling with Hunters Point Parks Conservancy at Gantry Plaza State Park will run from 7PM-9PM (line closes at 840PM). There are no reservations required to be a public participant. Just show up! Only by registering can you volunteer. Desk assistants: help people sign waivers and distribute environmental educational materials. Life vest fitters: help ensure that people are wearing the right size life vest and that straps are pulled tight for a safe, snug fit. Dock hands: help launch and land kayaks. This is more physically demanding and requires a bit of training. Water safety: Requires experience with HarborLAB and/or Red Cross and other water safety certifications. Many thanks to Waterfront Alliance for grants to help purchase safety equipment and cover other expenses, and to our regular sponsors. Grab a paddle — it’s summertime! All events listed below are FREE unless otherwise noted. Little Bay Park in Bayside, Queens. In partnership with Waterfront Alliance. Paddle at Family Earth Fair! MacNeil Park in College Point, Queens. In partnership with Coastal Preservation Network. LIC, Queens to Dumbo, Brooklyn and back on the East River. To celebrate World Oceans Day. Intermediate skills (basic paddle strokes, comfort in water, up to three hours of steady paddling). Canoe Flora Survey of Newtown Creek. Hunters Point to Maspeth and back while photographing plants and uploading data. In partnership with Newtown Creek Alliance and Hudsonia. 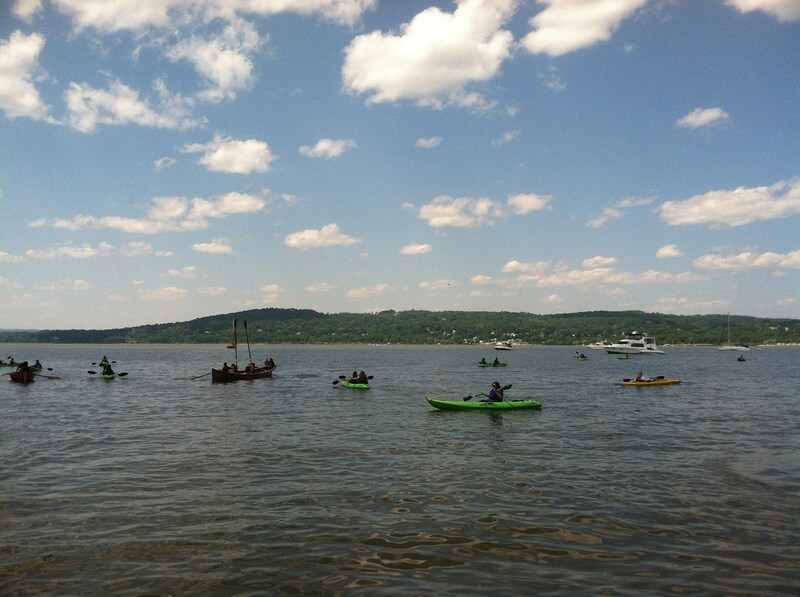 Paddle at the Clearwater Festival! Croton Point Park in Westchester. To support estuary and watershed education. *Public participants must pay a festival fee. HarborLAB volunteers selected to work the event go for free. Gantry Plaza State Park in LIC, Queens. Earth Week Events with HarborLAB and Friends! 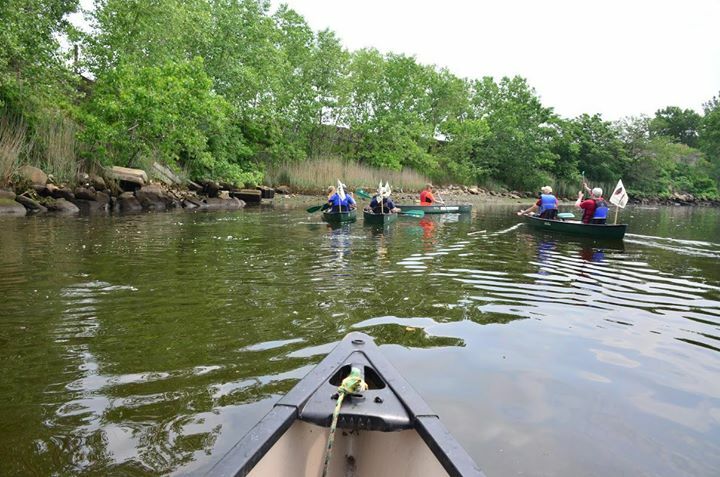 Give a little Earth love to the Newtown Creek and East River in the coming weeks with walking and canoe tours, shoreline cleanups, and planting native saplings and seeds! Plant native flowers and learn about how to make soil healthy! Though not Queens, our waterways are directly impacted. See HarborLAB’s launch, the City’s new launch, and our coming boathouse site! Clean the Shore at Hunters Point South Park! Remove plastic trash from our precious park shores! Participants who are 21+ are welcome to join us after at Skinny’s Cantina for a round of Mother Earth Margaritas sponsored by Sombra Mezcal, a 1% for the Planet brand. Paddle the length of the creek, noting the plants living along its shores! Shore support by bicycle and foot are welcome too! If you volunteered in 2017 or by March 27, 2018 inquired about volunteering for the 2018 season, please come to our annual volunteer meeting. We’ll discuss outcomes from our annual Board meeting, what we’ve accomplished as volunteers, and what goals we have for 2018. RSVP ASAP (agenda suggestions welcome) to volunteer@harborlab.org. Gitanjali Rao at her home lab. Photo by Bharati Rao. On this International Women’s Day we celebrate the girls and women who are advancing water ecology and safety. As we noted last year, women are the primary water providers for many impoverished rural families throughout South Asia, Latin America, and Africa. This requires walking miles each day, carrying water, and even then this precious resource is often fouled by pollution or disease. Women are also the primary gatherers of shellfish and edible sea plants in many cultures, where again natural resources are impacted by plastics, agricultural runoffs, spills, and sewage. But women and girls are also leaders in finding solutions through science and engineering. Today we celebrate one example: Gitanjali Rao, who at 11-years old won the Discovery Education 3M Science Challenge for her invention to detect lead in water and relay results instantly to a cell phone. Gitanjali, a student at a STEM school in Colorado, was inspired when her parents (both engineers) tested for the toxin with a conventional kit. Such kits yield results in days, not seconds, because samples must be sent to a lab. She realized that in Flint, Michigan and other places affected by lead in water supplies that was unacceptably slow. The young scientist’s system measures resistance in carbon nanotubes after uptake of lead from the water, though she’s refining the method because other materials can mimic that result. Gitanjali aims to become an epidemiologist or geneticist. No doubt Gitanjali will contribute advances to those fields too, and we hope she inspires generations of girls who follow. HarborLAB aims to expand the inspiration and tools of science to include all youth, especially those without the monetary and educational resources that come with having engineers for parents. We need all the brains we can get on water issues, and too many NYC girls are being sidelined by sexism, poverty, and nature deficit disorder. Whether aboard our boats or in the classroom, join HarborLAB in encouraging future scientists! Free Kayak Lessons in a Pool! 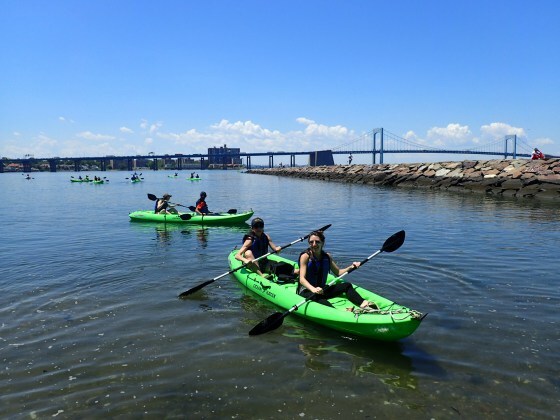 HarborLAB is happy to offer free introductory kayaking lessons by our American Canoe Association certified instructors and kindly hosted by Variety Boys & Girls Club of Astoria. This is part of HarborLAB’s Instruction for Inclusion program to safely welcome underrepresented communities into NY Harbor’s maritime life and careers, marine biology, and to inspire STEM studies through boating adventures in nature. We thank our volunteer instructors and coordinators, Steven Chu, Dee Dee Maucher, and Scott Wolpow, and instructor training by Prime Paddlesports. Students must agree to participants in all four lessons. Those who are assessed as successfully mastering Level One paddling skills will be sponsored for an introductory American Canoe Association membership. To express interest, please email edu@harborlab.org with the subject “Paddling at Variety Boys and Girls Club.” Include your name, age, and a statement of why you wish to begin paddling (for example, to see more nature, get exercise, overcome fear of the water, explore the city, make new friends, etc.). Open House on March 4! Come try the boats, meet the instructors and coordinators, and learn while playing. The first cohort session will consist of four Sundays, from March 11 through April 4, with classes for ages 8-12 running 3PM-4PM and ages 13-adult from 430PM-6PM. Each class will be followed by unstructured fun time to practice new skills independently, though instructors at their discretion can extend teaching as needed. First Cohort (10-12 students, divided into A and B groups of 5 or 6). March 4, 3-6PM: Open House! HarborLAB volunteers will introduce you to the boats, some paddling strokes, and how you or your kids will learn. March 11: Dee Dee, Scott, Steven and all assistant candidates (many just observing). 4PM-430PM: Unstructured pool time and/or volunteer training. 530-6PM: Unstructured pool time and/or volunteer training. March 18: Dee Dee or Steven and assistants and assistant candidates. March 25: Scott Wolpow and assistants and assistant candidates. 3PM-4PM: Special Games to Refresh and Reinforce. 430PM-530PM: Special Games to Refresh and Reinforce. April 1: Easter and Passover Break. April 8: Dee Dee or Steven and proven assistants. 3PM-430PM: Review and Level 1 Assessment. 430PM-6PM: Review and Level 1 Assessment.